The Dunedin Chinese Garden was blessed in June 2008, in the presence of Prime Minister Helen Clark and Chinese ambassador Zhang Yuanyuan and opened to the public on 8 June 2008. Prime Minister Clark returned to officially open the garden in September 2008. The Dunedin Chinese Garden was first proposed at the time of the city's sesqui-centennial celebrations in 1998. The garden is an authentic Chinese garden, having been created with the support of the Dunedin City Council and the Shanghai Municipal Government. As the concept of a garden gained momentum, the Chinese community established the Dunedin Chinese Garden Trust headed by councillor and then mayor Peter Chin, and a site was chosen close to the city's historic railway station and the Otago Settlers' Museum. The initial design concept was completed by landscape architect Bruce Young, who had worked extensively in Hong Kong and was very familiar with the design of Chinese Gardens. The Trust sought to create a fitting, permanent, recognition of the Chinese people who first came to Otago during the 1860s gold rush and stayed to establish some of the city's businesses. This contribution to business played a large part in making Dunedin New Zealand's leading commercial centre. Foundation stones were laid by delegates from the Garden’s committee and the Dunedin City Council, as well as the deputy mayor of Shanghai, Dunedin's Chinese sister city, in March 1998. The design of the Garden evolved over a period of eight years to ensure authenticity and cultural accuracy, as well as practical functionality. The Garden is in the traditional yuanlin style, and was designed by Cao Yongkang of Shanghai Jiao Tong University, Chen Ling of Tongji University, and Tan Yufeng of Shanghai Museum. They used as their basis the traditional gardens of the Jiangnan area, specifically because these gardens represent the apogee of Chinese garden style while at the same time being suitable for small sites in urban settings. The Garden's design and construction was closely supervised and influenced by the architect from the Shanghai Construction and Decoration Company and the Shanghai Museum. The Garden was pre-fabricated and assembled in Shanghai on a site identical in size and shape to that in Dunedin, then dismantled and transported here where it was reconstructed by artisans and supervisors from Shanghai. 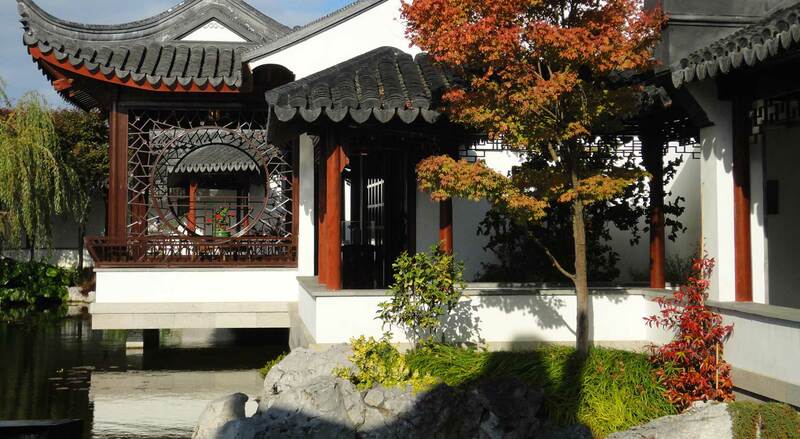 When construction was complete, the Dunedin Chinese Garden Trust handed the Garden to the Dunedin City Council to manage and ensure its continued authenticity and integrity as a lasting footprint of Chinese identity and culture.